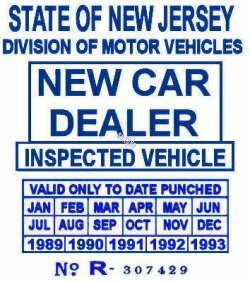 1989-1993 NJ NEW CAR DEALER stickers - $20.00 : Bob Hoyts Classic Inspection Stickers, Add a Final Touch to your Restoration! These stickers were placed on new cars and were accepted by the NJ MVD as legitimate inspection stickers. We know that they existed from 1979 to 1994 they went on the inside drivers side window and were valid for one year from the date punched. Buyer can punch year and/or month desired.